Is It a Myth That Black Shelter Pets Are Less Likely to Be Adopted? Ask most people involved in animal rescue, and they'll swear it's true: Black shelter pets are less likely to be adopted than pets of other colors. My own experience bears this out: During this year's Maddie's Pet Adoption Days event, the rescue for which I volunteer had very few dogs still looking for homes at the end of the second day, but the majority of those who were had — you guessed it — black fur. To counter this phenomena, many organizations offer discounts or hold adoption events specifically to place their black pets, and photographers have created special projects to showcase the animals' beauty. But is the belief based in fact — are black shelter pets really struggling to find forever homes? Dr. Emily Weiss of the American Society for the Prevention of Cruelty to Animals looked at the data from the ASPCA's A Comprehensive Animal Risk Database, which pulled numbers from 14 communities and nearly 300,000 dogs and cats, to learn more. She discussed her findings in a recent blog post. It all comes down to intake numbers, and there are more black dogs and cats in shelters than any other color. Thirty percent of the dogs taken in throughout 2013 were black, with brown coming in second at 23 percent. 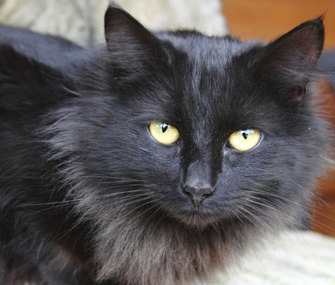 Black cats made up 33 percent of the feline intake, with gray cats coming in a distant second, at 22 percent. So, per the research, if three black dogs and one white dog enter a shelter, and one black dog and one white dog are adopted that day, that still leaves two black dogs waiting for homes. That means that the likelihood of your seeing more black dogs than any other color in that shelter is pretty high — but it does not necessarily mean that black dogs are being overlooked because of their color or that they aren't being adopted at all. The other reason Dr. Weiss suspects the belief persists is simply because we're human, and, as studies have shown, we're sometimes more likely to cling to a belief when confronted with facts and evidence that prove it wrong. That might sound crazy, but when a litter of kittens comes into a shelter and the black ones are the last to be adopted, it's hard to see past the black-pets-don't-get-adopted myth — even if those kittens eventually do find permanent homes. Perhaps the main thing to keep in mind here is that even if it's a myth that black animals are less adoptable than their lighter-colored counterparts, the fact remains that there are more black dogs and cats in need of homes, and they can still use additional promotion and attention in shelter situations. Do you have a black pet? Has your own adoption experience either backed up or debunked the black pet myth? Let us know below.